For petroleum refinery engineering, see Process engineering. Example of a map used by reservoir engineers to determine where to drill a well. 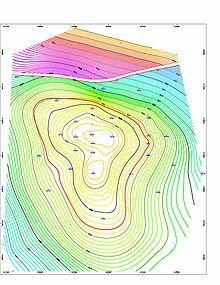 This screenshot is of a structure map generated by contour map software for an 8500 ft deep gas and oil reservoir in the Earth field, Vermilion Parish, Erath, Louisiana. The left-to-right gap near the top of the contour map indicates a fault line. This fault line is between the blue/green contour lines and the purple/red/yellow contour lines. The thin red circular contour line in the middle of the map indicates the top of the oil reservoir. Because gas floats above oil, the thin red contour line marks the gas/oil contact zone. Petroleum engineering is a field of engineering concerned with the activities related to the production of hydrocarbons, which can be either crude oil or natural gas. Exploration and production are deemed to fall within the upstream sector of the oil and gas industry. Exploration, by earth scientists, and petroleum engineering are the oil and gas industry's two main subsurface disciplines, which focus on maximizing economic recovery of hydrocarbons from subsurface reservoirs. Petroleum geology and geophysics focus on provision of a static description of the hydrocarbon reservoir rock, while petroleum engineering focuses on estimation of the recoverable volume of this resource using a detailed understanding of the physical behavior of oil, water and gas within porous rock at very high pressure. The combined efforts of geologists and petroleum engineers throughout the life of a hydrocarbon accumulation determine the way in which a reservoir is developed and depleted, and usually they have the highest impact on field economics. Petroleum engineering requires a good knowledge of many other related disciplines, such as geophysics, petroleum geology, formation evaluation (well logging), drilling, economics, reservoir simulation, reservoir engineering, well engineering, artificial lift systems, completions and petroleum production engineering. Recruitment to the industry has historically been from the disciplines of physics, chemical engineering and mining engineering. Subsequent development training has usually been done within oil companies. The profession got its start in 1914 within the American Institute of Mining, Metallurgical and Petroleum Engineers (AIME). The first Petroleum Engineering degree was conferred in 1915 by the University of Pittsburgh. Since then, the profession has evolved to solve increasingly difficult situations. Improvements in computer modeling, materials and the application of statistics, probability analysis, and new technologies like horizontal drilling and enhanced oil recovery, have drastically improved the toolbox of the petroleum engineer in recent decades. Automation, sensors, and robots are being used to propel the industry to more efficiency and safety. Deep-water, arctic and desert conditions are usually contended with. High temperature and high pressure (HTHP) environments have become increasingly commonplace in operations and require the petroleum engineer to be savvy in topics as wide-ranging as thermo-hydraulics, geomechanics, and intelligent systems. The Society of Petroleum Engineers (SPE) is the largest professional society for petroleum engineers and publishes much technical information and other resources to support the oil and gas industry. It provides free online education (webinars), mentoring, and access to SPE Connect, an exclusive platform for members to discuss technical issues, best practices, and other topics. SPE members also are able to access the SPE Competency Management Tool to find knowledge and skill strengths and opportunities for growth. SPE publishes peer-reviewed journals, books, and magazines. SPE members receive a complimentary subscription to the Journal of Petroleum Technology and discounts on SPE's other publications. SPE members also receive discounts on registration fees for SPE organized events and training courses. SPE provides scholarships and fellowships to undergraduate and graduate students. According to the United States Department of Labor's Bureau of Labor Statics, petroleum engineers are required to have a bachelor's degree in engineering, generally a degree focused on petroleum engineering is preferred, but degrees in mechanical, chemical, and civil engineering are satisfactory as well. Petroleum engineering education is available at many universities in the United States and throughout the world - primarily in oil producing regions. U.S. News & World Report maintains a list of the Best Underdegraduate Petroleum Engineering Programs. SPE and some private companies offer training courses. Some oil companies have considerable in-house petroleum engineering training classes. Petroleum engineering has historically been one of the highest paid engineering disciplines, although there is a tendency for mass layoffs when oil prices decline and waves of hiring as prices rise. SPE annually conducts a salary survey. In 2017, SPE reported that the average SPE professional member reported earning USD $194,649 (including salary and bonus), and the average base pay was USD $151,122. The average base pay reported in 2016 was $143,006. Base pay and other compensation was on average was highest in the United States where the base pay was USD $174,283. Drilling and production engineers tended to make the best base pay, USD $160,026 for drilling engineers and USD $158,964 for production engineers. Base pay on average ranged from USD $96,382-174,283. There are still significant gender pay gaps, which may be explained by males having an average of 19.4 years of experience and females having an average of 12.7 years, and in 2017 more than half of female respondents reported an increase in base pay received since 2016. In 2017, the United States Department of Labor's Bureau of Labor Statistics reported the median pay for petroleum engineers was USD $132,280, or roughly $63.60 per hour. The same summary projects that there will be 15% job growth in this field from 2016 to 2026. Also in 2016, U.S. News & World Report named petroleum engineering the top college major in terms of highest median annual wages of college-educated workers (age 25-59). The 2010 National Association of Colleges and Employers survey showed petroleum engineers as the highest paid 2010 graduates, at an average annual salary of $125,220. For individuals with experience, salaries can range from $170,000 to $260,000. They make an average of $112,000 a year and about $53.75 per hour. In a 2007 article, Forbes.com reported that petroleum engineering was the 24th best paying job in the United States. Reservoir engineers work to optimize production of oil and gas via proper placement, production rates, and enhanced oil recovery techniques. Drilling engineers manage the technical aspects of drilling exploratory, production and injection wells. Drilling fluid engineers A mud engineer (correctly called a Drilling Fluids Engineer, but most often referred to as the "Mud Man") works on an oil well or gas well drilling rig, and is responsible ensuring the properties of the drilling fluid, also known as drilling mud, are within designed specifications. Completion engineers (also known as subsurface engineers) work to design and oversee the implementation of techniques aimed at ensuring wells are drilled stably and with the maximum opportunity for oil and gas production. Production engineers manage the interface between the reservoir and the well, including perforations, sand control, downhole flow control, and downhole monitoring equipment; evaluate artificial lift methods; and select surface equipment that separates the produced fluids (oil, natural gas, and water). ^ a b "Petroleum Engineers: Occupational Outlook Handbook: U.S. Bureau of Labor Statistics". www.bls.gov. Retrieved 2018-02-06. ^ "Petroleum Engineering". Britannica. Retrieved 3 February 2012. ^ "Drilling Automation". Journal of Petroleum Technology. December 14, 2017. ^ "JPT Flow Sensor Technology Seeks to Replace the Coriolis Meter". www.spe.org. Retrieved 2017-12-14. ^ "JPT Competing Companies Building Robots to Place Receivers". www.spe.org. Retrieved 2017-12-14. ^ "JPT Robot Removes Operators From Extreme Environments". www.spe.org. Retrieved 2017-12-14. ^ "SPE Member Resource Guide" (PDF). Society of Petroleum Engineers. Retrieved December 12, 2017. ^ "Publications | The Society of Petroleum Engineers". www.spe.org. Retrieved 2017-12-14. ^ a b "Professional Membership Benefits | Society of Petroleum Engineers". www.spe.org. Retrieved 2017-12-14. ^ "Best Undergraduate Petroleum Engineering Programs (Doctorate)". U.S. News & World Report. February 6, 2018. ^ "PEICE – Practical Professional Career Training for the Oil & Gas Industry". www.peice.com. Retrieved 2017-12-14. ^ "PetroSkills Oil and Gas Training | World's Petroleum Training". www.petroskills.com. Retrieved 2017-12-14. ^ "Online Training, Online Courses, Web-based Learning Management System - Learning Management Express(LMX) - NexLearn". www.oilandgastraining.com. Retrieved 2017-12-14. ^ "Energy Pipeline: Noble Energy's outdoor training facility brings industry to community's fingertips". Retrieved 2017-12-14. ^ "Oil and Gas Training & Career Development | Schlumberger". www.slb.com. Retrieved 2017-12-14. ^ a b "Oil and Gas Pay | Salary Survey | Society of Petroleum Engineers". www.spe.org. Retrieved 2017-12-14. ^ a b "2017 SPE Membership Salary Survey Highlight Report-November 2017" (PDF). Society of Petroleum Engineers. January 3, 2018. Retrieved January 3, 2018. ^ "Top 10 College Majors That Earn the Highest Salaries". U.S. News & World Report. February 6, 2018. ^ "NACE:". Naceweb.org. Retrieved 2011-12-18. ^ "America's Best- And Worst-Paying Jobs". Forbes.com. 2007-06-04. Retrieved 2011-12-18.